A Westchester man wearing a bullet-proof vest and a ski mask was arrested inside the Waldorf Astoria Monday morning, police said. 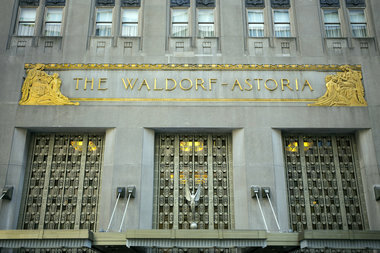 MIDTOWN — A mentally ill Westchester man wearing a bullet-proof vest and a ski-mask — and carrying an empty gun holster on his hip — was arrested after trying to take a shower in the Waldorf Astoria Monday, police said. Christopher Goodine, 26, walked into the lavish Park Avenue hotel, near 50th Street, roughly 11 a.m. and went up to the 19th floor to scrub up in the hotel spa, the NYPD said. A frightened hotel guest noticed him and called hotel security, who then alerted the NYPD, police sources said. Police searched the hotel and nearby blocks for a weapon, but didn’t find one, police said. Goodine, of New Rochelle, was charged with criminal trespassing. He has no arrest history in New York, but has had run-ins with law enforcement in Florida, Virginia, Georgia and Washington, D.C., police sources said. It wasn't immediately clear what crimes were related to his prior arrests.